This wide view of the Meathook Galaxy shows its bent spiral arms, and glowing pink regions of hydrogen gas where lots of stars have recently formed. 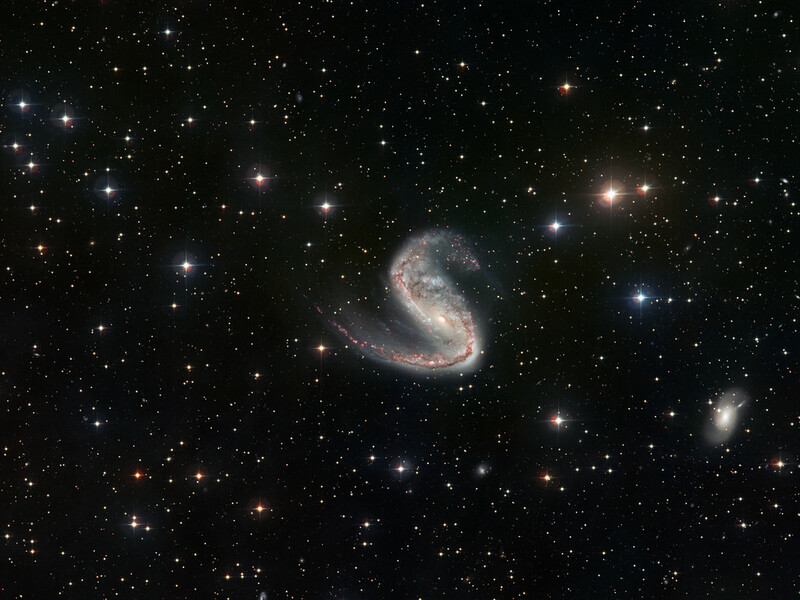 THE MEATHOOK GALAXY, or NGC 2442, has a dramatically lopsided shape. One spiral arm is tightly folded in on itself and played host to a recent supernova (exploding star), while the other, dotted with glowing regions of recent star formation, extends far out from the galaxy’s core or nucleus. The galaxy’s distorted shape is thought to be the result of the gravitational pull of a passing galaxy at some point in the past, though astronomers so far have not been able to positively identify the culprit. The broad view, taken by the Wide Field Imager on the MPG/ESO 2.2-metre telescope at La Silla, Chile, very clearly shows the double hook shape that gives the galaxy its nickname. It also captures several other galaxies close to NGC 2442 as well as many more remote galaxies in the background. A close-up Hubble view of the Meathook Galaxy shows its core as well as the more compact of its two spiral arms. The close-up image from the NASA/ESA Hubble Space Telescope focuses on the galaxy’s nucleus and the more compact of its two spiral arms. In 1999, a massive star at the end of its life exploded in this arm…a phenomenon known as a supernova. Although the Wide Field Imager, being a ground-based instrument, cannot approach the sharpness of images from Hubble in space, it covers a much bigger section of sky in a single exposure. Combining ground- and space-based imagery often gives astronomers deeper insights. The wide view also highlights the starting point of the life cycle of stars. Dotted across much of the galaxy, and particularly in the longer of the two spiral arms, are patches of pink and red. This colour comes from hydrogen gas in star-forming cloud regions—the powerful radiation of new-born stars ‘excites’ the gas in the clouds, making them glow a bright shade of red. The near miss with the other galaxy is likely to have been the trigger for this recent burst of star formation. The same tidal forces that deformed the galaxy also disrupted the gas clouds and made them gravitationally collapse in on themselves, leading to the birth of new stars. Adapted from information issued by ESO. Images courtesy NASA/ESA and ESO.